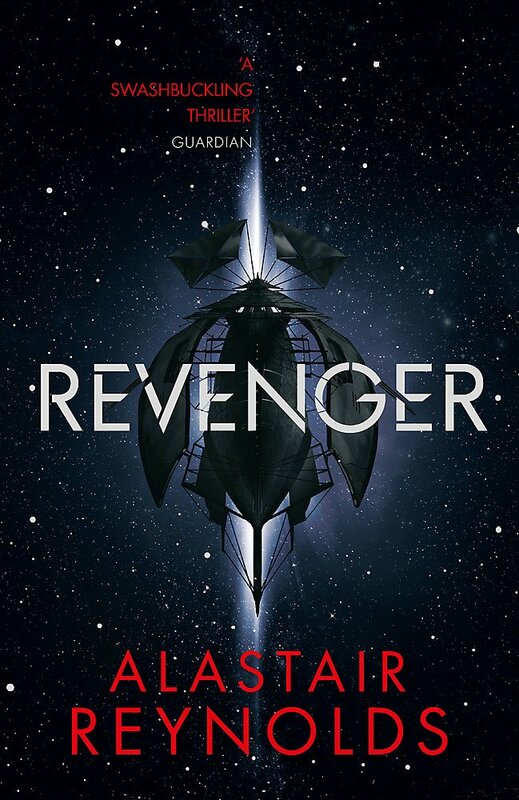 I confess I got this rather back-to-front, reading the second novel in this series, Shadow Captain before this, the first. 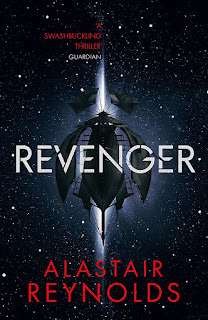 If anything, Revenger is slightly better than the second title, though both are excellent, and my opinion of the second book has been raised by reading this one, because it benefits from the context. We follow the Ness sisters Arafura and Adrana into space in this far future adventure. What I didn't realise on reading the second novel, which is written from the viewpoint of Adrana, is that the first was written from the viewpoint of Arafura, and this contrasting approach really opens up some interesting aspects of what's going on and the differences between the sisters. By far the best thing about this book is Reynolds' superb world-building. This is a very different solar system, millions of years in the future, when the planets have been long demolished producing millions of small habitats which have been repeatedly occupied and lost in a series of rises and falls of civilisation (the so-called Occupations). We see Arafura go from a rather spoiled brat sister to the older and more cynical Adrana to being a hard case who is driven to take on a piratical captain. Seeing the development of Arufura's character gives her a bit more depth than is clear in Shadow Captain, where she merely comes across as difficult, manipulative and far too young for her actions. It's interesting to wonder if the less pleasant Arafura in the second book is intended to be real or just Adrana's biassed viewpoint. There are also elements of the back story here which help explain some aspects of Shadow Captain, notably the nature of the coinage 'quoins', which play a significant part in the latter - it might have been helpful if that revelation had been brought through to the second book. One oddity that struck me in Shadow Captain, but even more so here, is the peculiar use of language. Given this is set millions of years in the future, we can't expect them to be speaking English - so anything we read is effectively posed as a translation. That being the case, I don't understand why just a few words are rendered in a peculiar fashion. (I'm not talking about the 'common' usage, such as 'ain't' and 'coves', which is fine as dialect.) Most notably, air is called 'lungstuff'. This seems designed to give the writing an appropriate period feel for the piratepunk atmosphere (there may not be such a word, but there ought to be), but it sits strangely and seems unnecessary. Overall, a great story with so many interesting ideas that translates the classic shipboard adventure into the far future with great aplomb.